RICHARD O’RAWE has had a life that itself reads like a novel – he’s a former IRA prisoner who was interviewed for the Boston Tapes, and who was a blanketman during the time of the Troubles’ dirty protests. He’s also a chronicler of what happened during the Troubles, having written a biography about his friend Gerry Conlon – one of the Guildford Four – and a book about the hunger strikes on H-Block, Blanketmen. But while he was penning these works of non-fiction, the Belfast native was also working on the fictional story of a bank robbery. The result is Northern Heist, a book that so interested his publisher Merrion Press that they threw out their rule of only publishing non-fiction for it. Northern Heist is, of course, about a heist, and is influenced by a spate of tiger kidnappings in the 1990s, as well as a bank robbery in the early 2000s. But when the author has such an interesting story himself, the first question TheJournal.ie had to ask was how much of it was inspired by his own life. “I knew people who might have had traits that the characters in the book have. However I would say that the book is absolutely fictional, the characters are absolutely fictional, and the writing is absolutely fictional,” he says. They say lazyboneitis is in the blood. It isn’t in James ‘Ructions’ O’Hare’s blood. Not When it comes to robbing banks. O’Rawe kept the dialogue authentic, saying it’s what “you would hear amongst a certain class of people in Belfast”, though it’s not strictly Belfast vernacular. O’Rawe kept “nibbling at” the book over the period of about eight years. After he finished the Gerry Conlon book, he returned to Northern Heist and ended up re-writing half of it. Writing fiction was an enjoyable process for O’Rawe. “The freedom was great because you’re not restricted. You can go where you want – the house can be falling apart, could be burnt down and I’d still be sitting there writing away and I wouldn’t know,” he laughs. Part of what he wanted to do with Northern Heist was “to demonstrate that these tiger kidnappings are not a painless process”. It’s clear in the book the level of violence such an act requires, and exactly how people can be traumatised by it. “There are people hurt here. Even if there’s no one shot, even if the robbers get away with the money and the family’s left intact, there’s a residue of pain left behind because the family is put through a horrendous time,” says O’Rawe. The family is held at gunpoint, the whole point of the thing is the manager of the bank is told ‘if you don’t bring us some money we will shoot your family’. Can you imagine how horrific that must be for him and even it’s pretty cowardly, it’s a pretty cowardly way to get money in my view. Although O’Rawe says that the book is fiction, there will undoubtedly be parallels drawn to the Nortern Bank in Belfast robbery. At the time, in 2004, it was the biggest heist that had ever happened in the UK, with £26.5 million taken from the Donegall Square West headquarters of the bank. Some of the robbers pretend to be police officers, and held a number of bank officials and their families hostage, with one being told to report for work as normal and steal £1 million. The main robbery took place that evening. He says he was fascinated with the tiger robberies that took place from 2002 – 2004 in Belfast. ”It struck me that these jobs were so professionally done that it was the same people doing them all,” he says. When the Northern Bank was hit, it was said that the Provisional IRA did it. This was denied by both the Provisional IRA and Sinn Féin. Does he agree with the assessment that the IRA did it? It was his wondering about what would have happened if the PIRA weren’t involved that got him to create Ructions, who in the book does not want the ‘Provos’ to get their hands on the heist money. He says this was important to show this streak “because amongst criminal elements there is a sort of a code, and this code is not always honoured but a lot of these criminal guys do have honour about them in their own terms”. The public in general wouldn’t equate their sense of decency with society’s, but in their view and in their own terms they have a certain integrity, and there’s a certain code that they practice and Ructions is very much of that mould. O’Raw believes it’s always important to show people that people aren’t perfect, saying “it’s richer because people are imperfect, because there are problems and problems need to be solved and solving problems enriches all our lives”. O’Rawe wrote the book Blanketmen “out of frustration more than anything else”, but it was a huge step for him to go public with the story. He was PRO for the prisoners during the H Block hunger strikes, and privy to the negotiations that took place. He disagreed with it being portrayed that Margaret Thatcher “was being inflexible and Thatcher was a scoundrel” during the negotiations. He is not happy with how he says the negotiators dealt with her offer that all prisoners would have their own clothes. “That was the crucial one and then everything else beyond that there was negotiable,” he explains. The hunger strike continued. Another six men died. As a consequence, O’Rawe was very unhappy with those who made the decisions during the negotiations. When he was questioned about this for the Boston College Tapes by Anthony McIntyre in 2001, his frustration and hurt and anger came out. “It was the first time I’d really told it in detail to anyone,” he says. It was like that a watershed and I cried I couldn’t stop crying I mean I literally couldn’t, once I was telling it and I realised it and I was literally living it again, I cried my eyes out uncontrollable and I just said that night I says I am not going to wait till I die, I’m gonna tell this story. He says he is in a good place now, describing himself as having “done what my conscience told me”. He says he is “conscience driven”, admitting it “sounds very sort of bombastic”, but it’s true. Before we part ways, the topic of Brexit comes up. “I’ve never seen things as convoluted,” he says of what’s going on, before adding: “I think in terms of a united Ireland it’s never been as close.” He thinks middle class ‘soft’ unionism will want a united Ireland if there’s a hard Brexit, and “will say ‘our interest is in Europe, let’s stay’”. “The whole dynamic’s changed. It’s no longer about simple nationalism, Britishism vs Irishism. That’s all gone. Europeanism has replaced Irishism and the Irish State, the republic has been fantastic,” says O’Rawe. He’s seen things change from the Troubles to through to the peace process, and he sees further change on the horizon. Northern Heist is out now, published by Merrion Press. Email “'Can you imagine how horrific that must be? ': Ex-IRA man pens book about tiger robberies”. Feedback on “'Can you imagine how horrific that must be? 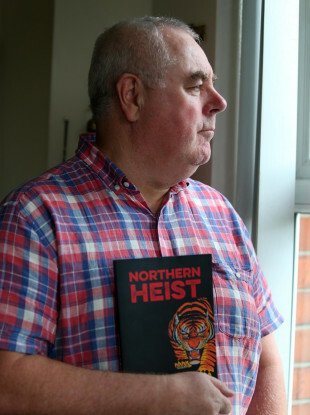 ': Ex-IRA man pens book about tiger robberies”.